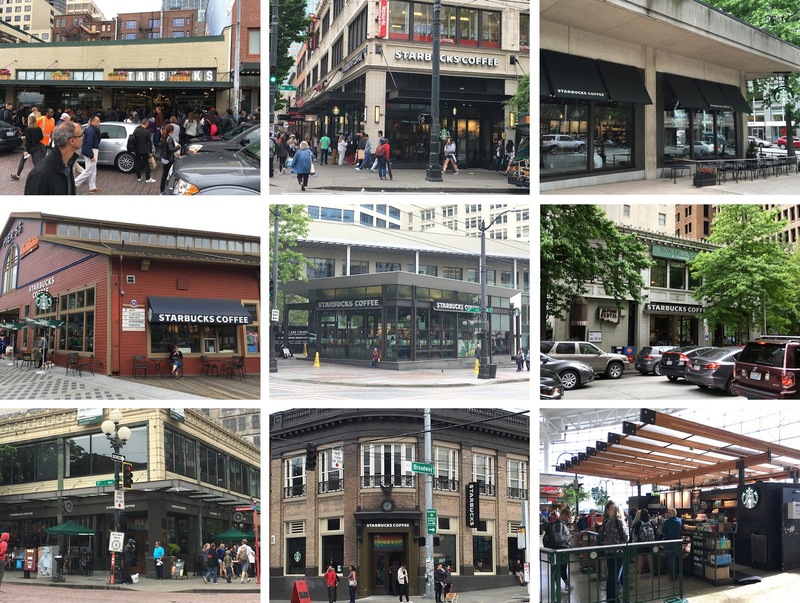 I did not have to go out of my way to find Starbucks in Seattle. However, I understand that the one at top left is the original coffee shop that built an empire, which would explain the constant scrum of pilgrims snaking out the door and down the block. 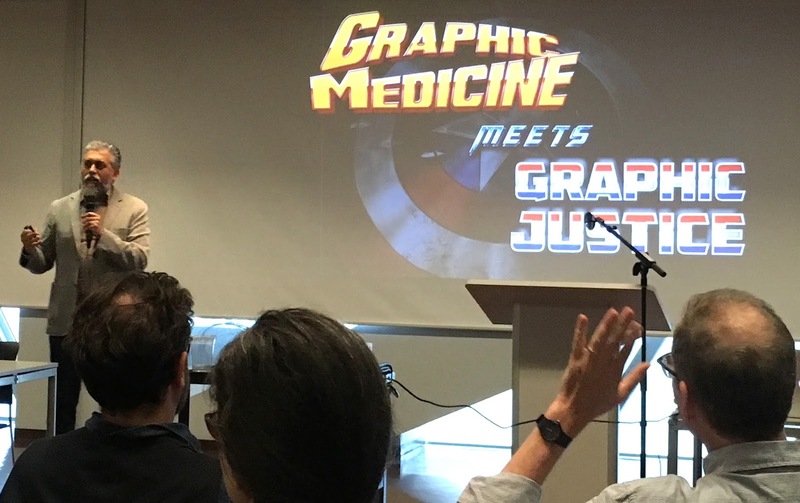 There've been eight international Graphic Medicine Conferences since 2010. I've been to six of them. We've developed some traditions, one of which is that I always write a long and windy blog post when I get home. Another tradition, as explained by graphic medicine (GM) guru Ian Williams, is that if I don't proclaim every conference "the best one ever," they'll know they've failed. Luckily, this was the best one ever. 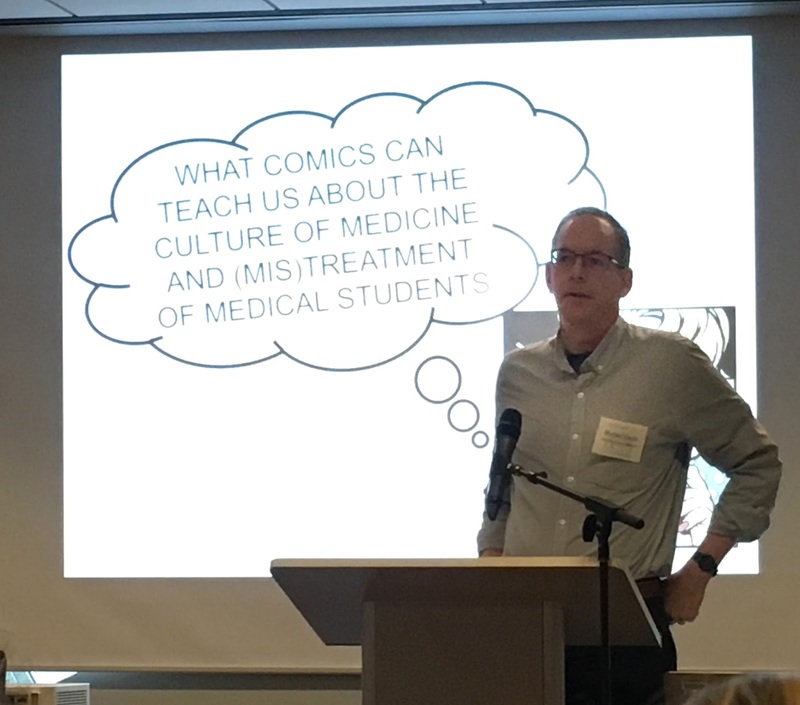 Comics and medicine seems like an odd combination, but it works. Patients make comics about being patients, doctors and nurses make comics about being doctors and nurses. Comics teach kids how to use inhalers, encourage Australian aborigines to use public health clinics, and get informed consent from hospitalized children. 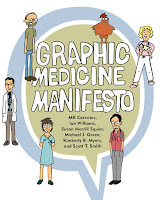 In addition to tons of graphic memoirs that touch on medical topics (mine, Epileptic, Cancer Made Me a Shallower Person, Pedro & Me, Special Exits, Hyperbole and a Half, Can't We Talk About Something More Pleasant?, Tangles, Marbles, Psychiatric Tales and many many more), people find myriad fascinating ways to work comics into healthcare themes or practice. Professors, students, doctors, nurses, writers, artists, cartoonists and others get together at these conferences to meet and compare notes. People come from all over North America, Europe, Australia, Japan and more. It's a big tent. In every previous conference, I've done some sort of talk or workshop. It took me this long to figure out I could just go to the thing without doing all that work. I recommend it! 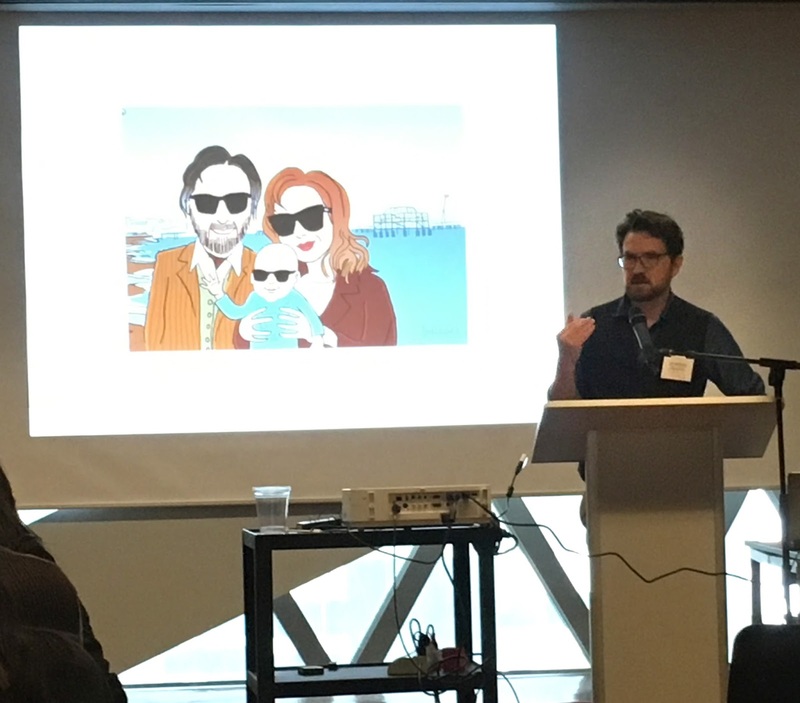 The aforementioned Ian Williams, one of two proprietors of the GM website, coiner of the term "graphic medicine," a British M.D., author of The Bad Doctor graphic novel, co-author of The Graphic Medicine Manifesto, and recent first-time father. 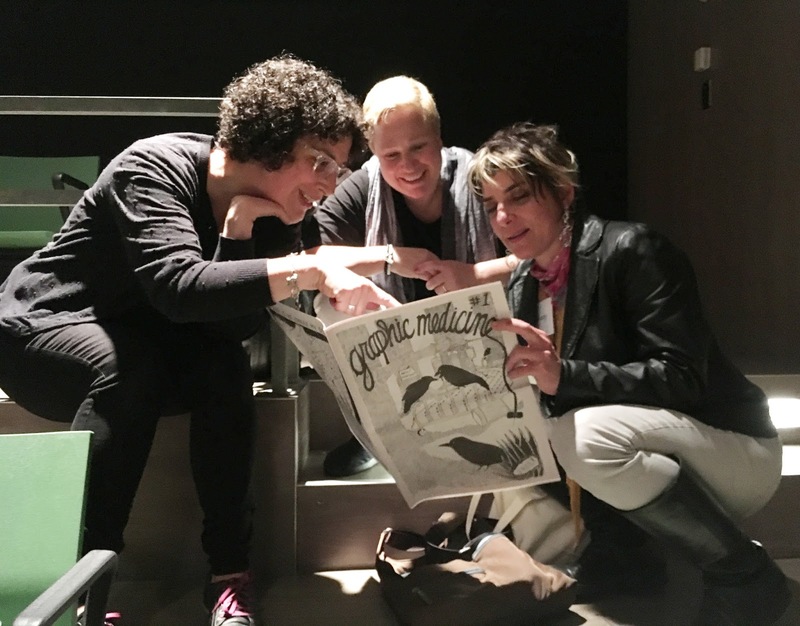 "Comic Nurse" MK Czerwiec, the other proprietor of the website, a Chicago nurse and teacher, another co-author of The Graphic Medicine Manifesto, and author of the new graphic novel Taking Turns about her experience on an early AIDS ward. Mita Mahato, an associate professor of English and cartoonist who does beautiful cut-paper art, has a book of poetry coming out in the fall, and was the on-the-ground lead for the Seattle conference. Susan Squier, professor of English and Women's, Gender and Sexuality Studies at Penn State University, yet another co-author of The Graphic Medicine Manifesto, and part of the organizing committee. Michael Green, an M.D. 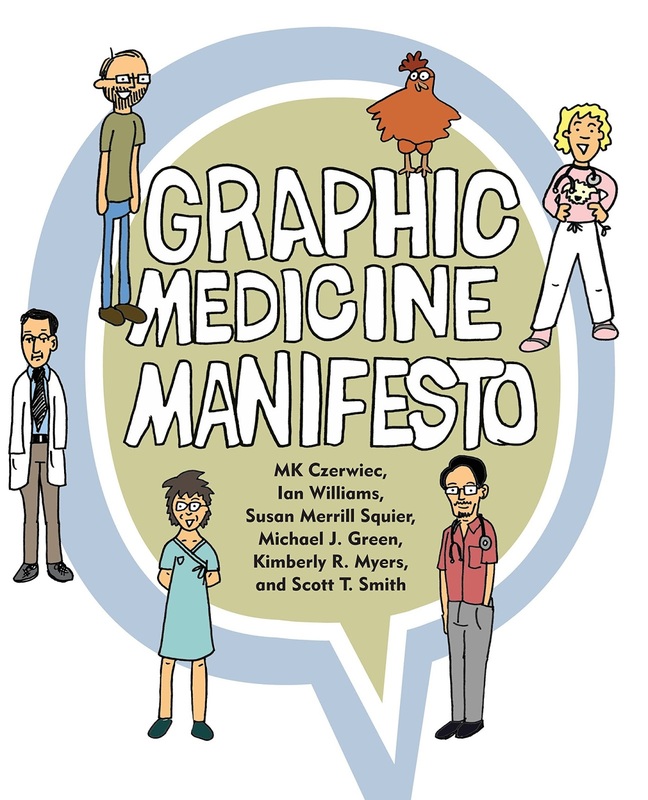 and bioethicist at Penn State University, yet another co-author of The Graphic Medicine Manifesto, and part of the organizing committee. 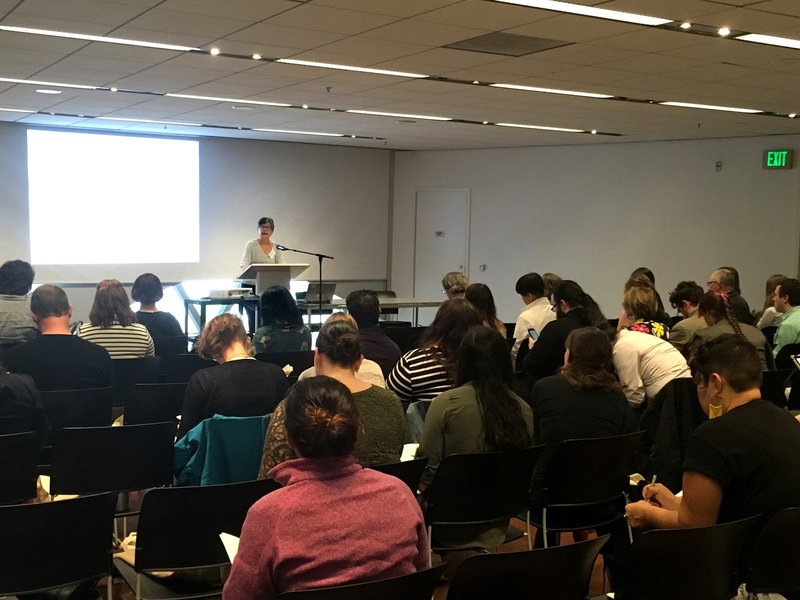 Juliet McMullin, a cultural and medical anthropologist at UC Riverside, who led the organizing for 2015's conference in Riverside, Calif. The conference was held at the main Seattle Public Library, a modern steel and glass building with a strange fourth floor, where some of our sessions were held. The whole level was painted red, with intense spotlighting and twisting, rounded walls. It felt like being inside a living heart and was a little unnerving. The fourth floor. Lub-dub, lub-dub, lub-dub, redrum. Ian Williams and MK Czerwiec, photobombed by Mita Mahato. I love this picture. Smart and talented Shelley Wall and Dana Walrath have been important parts of these conferences. Shelley organized the Toronto conference in 2012 and helped organize this one; Dana authored a book titled Aliceheimer's and presented on her latest project in Seattle. Tangles cartoonist Sarah Leavitt, MK, and Marbles cartoonist Ellen Forney pretend to peruse an anthology of comics produced for the conference because they saw my camera and wanted to look impressive. "So four doctors and a lawyer walk into a bar . . ." In front, cartoonist-physicians Ian Williams, cartoonist-physician Theresa Maatman, and non-cartoonist physician Michael Green. Behind, professor and attorney Dan Bustillos and Australian psychiatrist-cartoonist Neil Phillips. A few interesting themes spontaneously emerged over the weekend. One concerned the growth and spread of the GM concept. 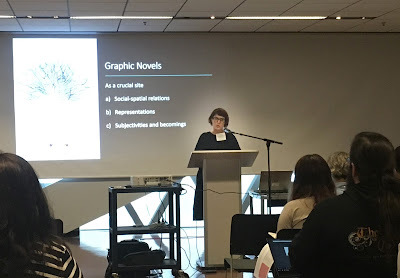 I heard a lot about Graphic Anthropology--not sure what it is or who does it, though I suspect Juliet McMullin is a ringleader. Professor-lawyer Dan Bustillos, whose classes I occasionally crash via Skype, introduced me to Graphic Justice, which is what happens when comics meet law. There were a lot of young first-timers at this conference, and, it seemed to me, a real explosion of recent books that fit under the GM umbrella. When I did Mom's Cancer there were maybe one or two dozen in the canon; now it seems like there are hundreds. An overview of the big, main auditorium where the keynote speeches and some of the panels took place. Other panels were in rooms on the red fourth floor (shudder) upstairs. 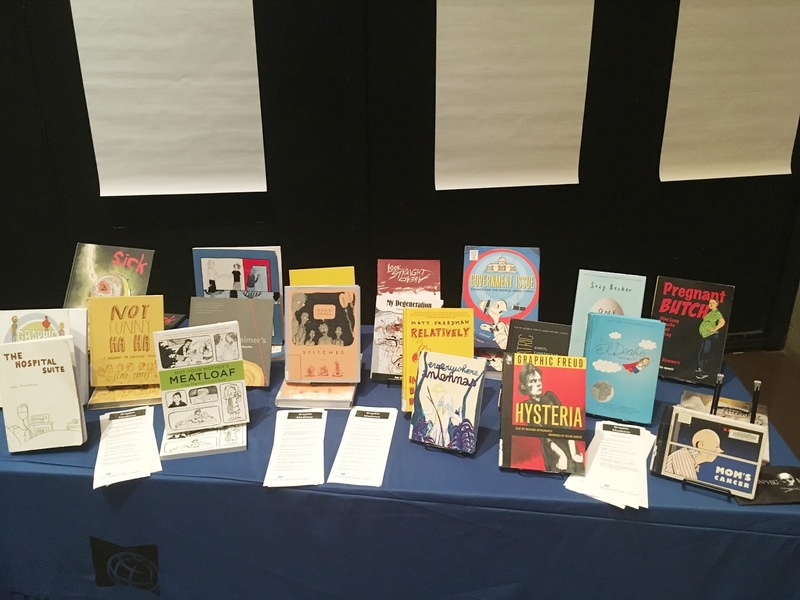 The Seattle Public Library pulled several GM comics from their shelves for display and browsing, and provided reading lists for dozens more. The white sheets of paper on the wall were taped up for people to draw on. 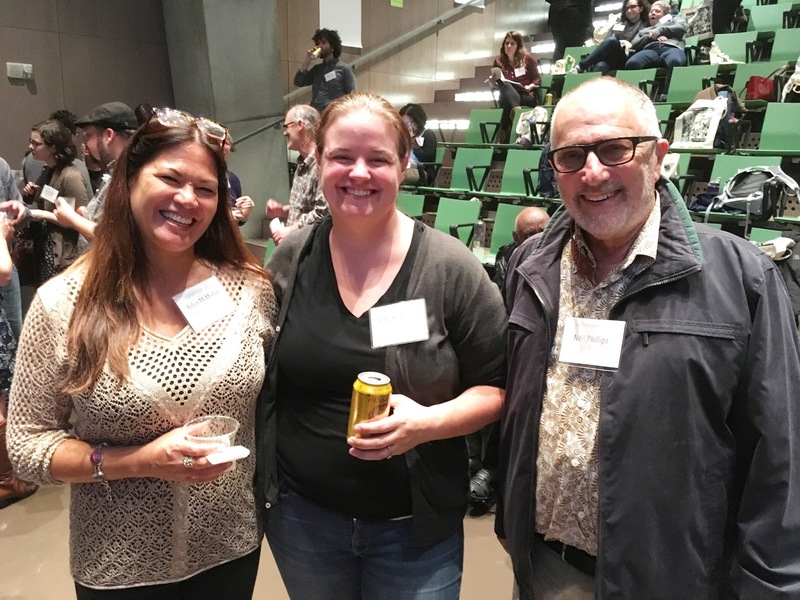 Conference co-planner Meredith Li-Vollmer, Eisner-winning cartoonist David Lasky, and Nikki Eller talk about public health comics they've made for King County (Wash.) that have been translated into two dozen languages. Behind them is original art for a silent auction. 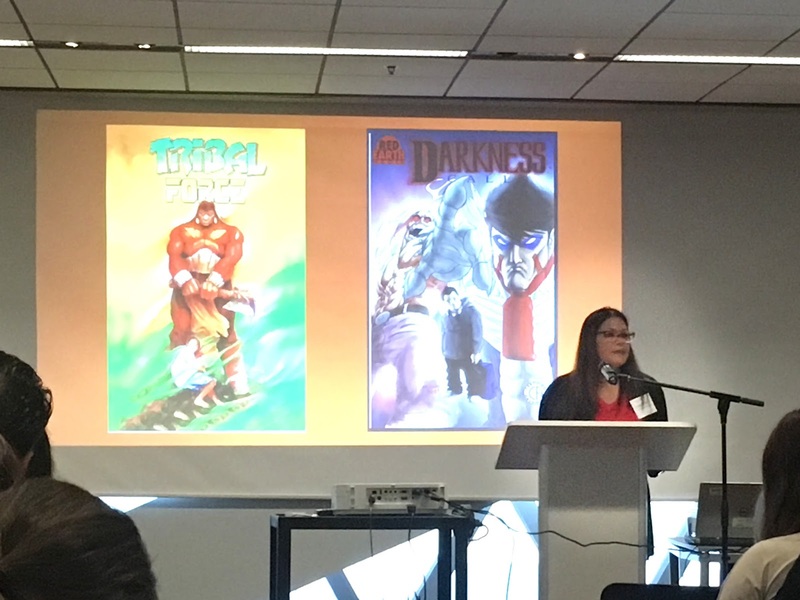 Juliet McMullin on "Accessing Land-Based Health with Indigenous Graphic Narratives." 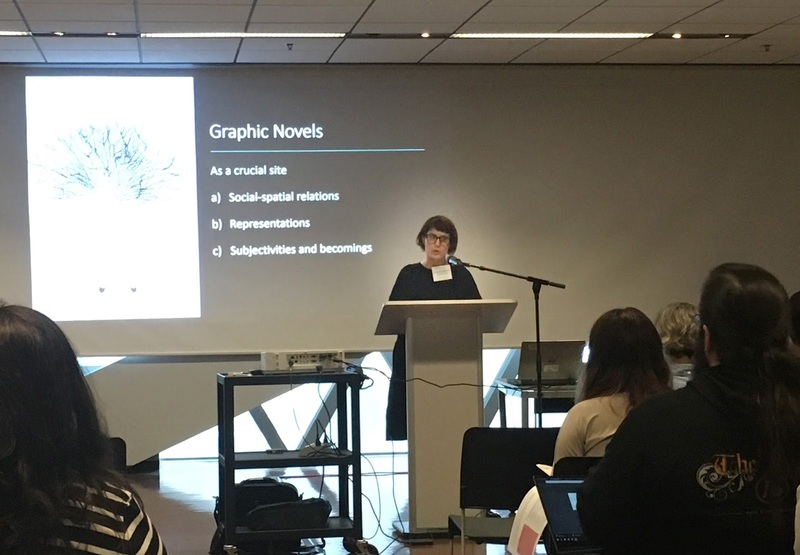 Courtney Donovan of San Francisco State University on "Graphic Narratives and Nomadic Subjectivities." Susan Squier moderating a panel in one of the smaller rooms. Juliet McMullin, Amerisa Waters (who's working toward her PhD in Medical Humanities), and Neil Phillips. Journalist-comedian-cartoonist Aaron Freeman and Mita Mahato. Ian Williams illustrated a wry and dry progress report on his next book with a drawing of his family. Michael Green has medical students make comics about the hardships of medical school. The results are enlightening. Dan Bustillos is a strong, dynamic speaker. I'll bet he's a good teacher. That's Michael Green raising his hand. Some people told me how much they appreciated Mom's Cancer, and many cited it in their talks or said they teach it in their classes, which is a deeply gratifying legacy. The conference ended with a marketplace for people to sell their stuff. I'd brought a pretty big stack of cash to spend, but still ran out of money--and, more importantly, space in my carry-on luggage--before I hit all the tables. Sorry, I did my best. Peter Dunlap-Shohl (My Degeneration), MK Czerwiec and Ian Williams selling well at the marketplace. All three are published by Penn State University Press, whose Graphic Medicine Series is growing into an impressive and important library. 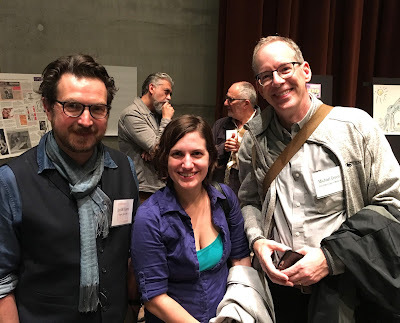 Kurt Shaffert (second from left) and James Sturm (right) from the Center for Cartoon Studies have committed to hosting the next GM Conference in White River Junction, Vermont. Fools. Mark your calendar for August 16-18, 2018. My haul from the marketplace. I'm looking forward to reading it all. Both nights of the conference were capped with extracurriculars. After the first full day, many attendees made the long trek south to the Fantgraphics Bookstore and Gallery, which for fans of sophisticated comics literature is a bit like a pilgrimage to Mecca. It's a small space packed with terrific stuff. After the second day, we adjourned to the Raygun Lounge, another funky space providing beverages, gaming tables, and vintage pinball machines. One little wing of the Fantagraphics store. As I wrote on Facebook, what I really love about these GM conferences is the improbable confluence of events that would put cartoonists Ellen Forney, David Lasky and me talking shop in a corner of the Fantagraphics bookstore. Before that moment, I wouldn't have bet those odds. Another selfie, this one the next day with MK at the Raygun Lounge. 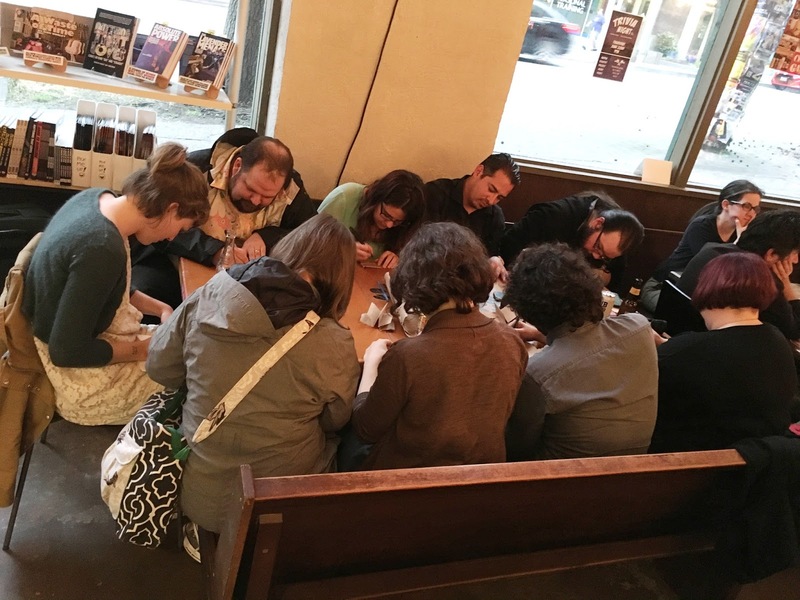 You can tell these people are artists because they all have their heads down drawing instead of drinking, talking, brawling, or dancing on the table. 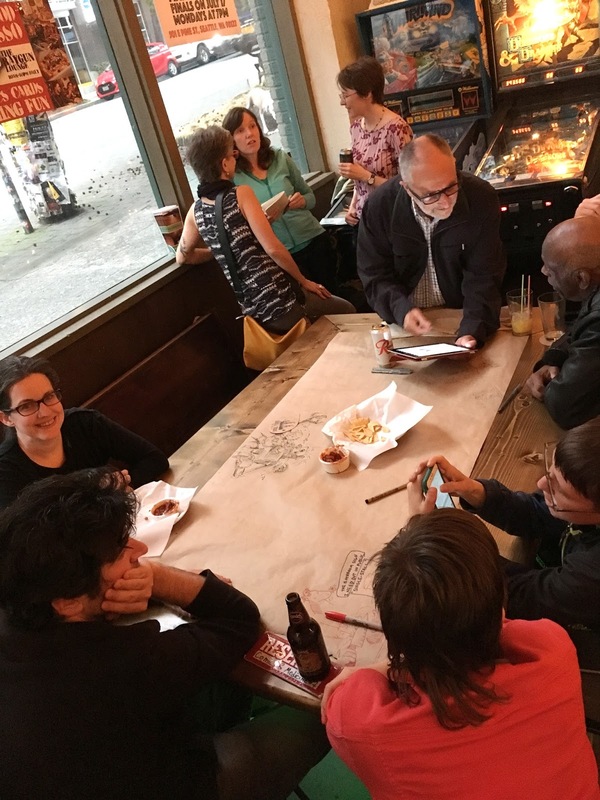 A second table at the Raygun covered with butcher paper for art, with Neil Phillips at the head and our wonderful final keynote speaker Rupert Kinnard to Neil's left (your right). Do yourself a favor and click the link on Rupert's name; his life and work cover a lot of struggle and history. I'd been sitting in that empty space along the window and did that black scribble that I'll show you after I explain something . . .
One interesting theme that emerged through the conference was "catharsis." More than one presenter talked about how making comics about illness and medical care isn't really cathartic at all: it's too hard, too slow, and doesn't accomplish the "expelling and healing" that catharsis implies. So some of us were sitting around near the end of the last day agreeing that that was a good point when Rupert Kinnard talked for an hour about comics as catharsis and introduced the humorous past-tense verb "catharted." Rupert confused and unconvinced me. So later at the Raygun I did a doodle of my Last Mechanical Monster and the Cosmic Kid, to which my friend Mita Mahato added the red word balloons "I Catharted" and "Um...I know." And then we just doodled together while we talked, adding a mountain landscape, UFOs, and a little outhouse on the Moon in a way I haven't since my kids and I drew on restaurant placemats when they were toddlers. I highly recommend it. Seattle is a good city for hosting an event like this. Its core is very walkable, public transit is convenient and not too hard to figure out, and its setting is beautiful. The vagaries of flight schedules made it best for me to arrive a day early and fly home a day late, immediately after a reading and signing for MK's book Taking Turns at a local bookstore. Of course I walked the waterfront and Pike Place Market. With time to kill and a passion for World's Fairs of the past, I also visited the site of the 1962 World's Fair, riding the monorail built for the event to its centerpiece, the Space Needle. Imagine my astonishment finding the Museum of Pop Culture (MoPOP) right next door, then my giggling delight at finding it had a wing dedicated to "Star Trek." The 1962 ALWEG monorail, built by the same folks who did Disneyland's. Retro cool transportation of the past future. Or the future past. Whichever. An angle on the Space Needle shot through some floral metal sculptures (hard to tell from this angle, but the flowers are about the height of light posts). The Space Needle does that thing where they have visitors stand in front of a green screen to be superimposed onto different backgrounds (it's free, which it isn't most places). Since I was alone and didn't care, I asked the photographer if I could do something odd. She was game. Later, when scrolling through possible backgrounds, I saw this one, guffawed, and knew I'd found my match. You take one wrong step . . . The monorail track ends in this Frank Gehry building that houses the MoPOP. Ohmygod. 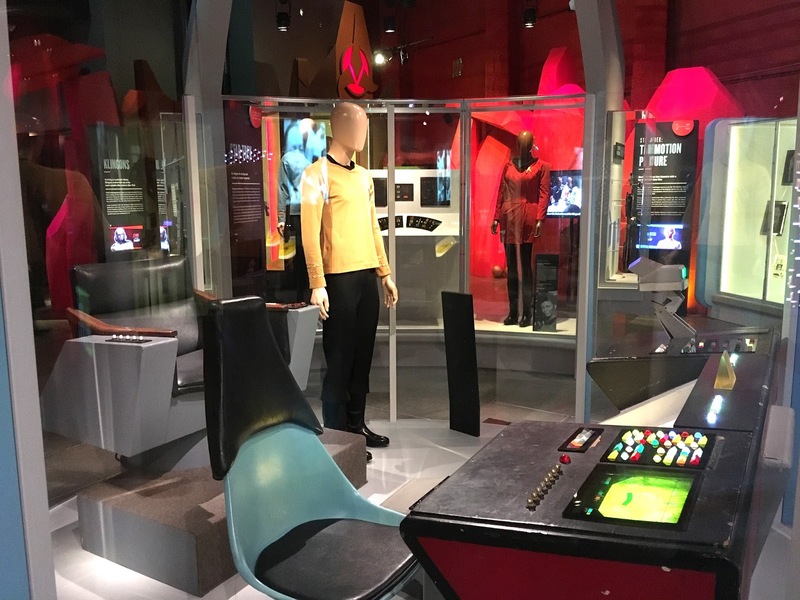 It's Captain Kirk's actual chair, and Sulu and Chekov's actual console. 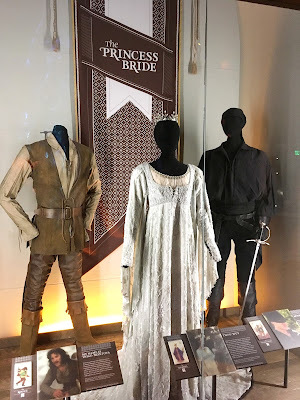 And Kirk's actual tunic. And Uhura's actual dress. Ohmygod ohmygod! 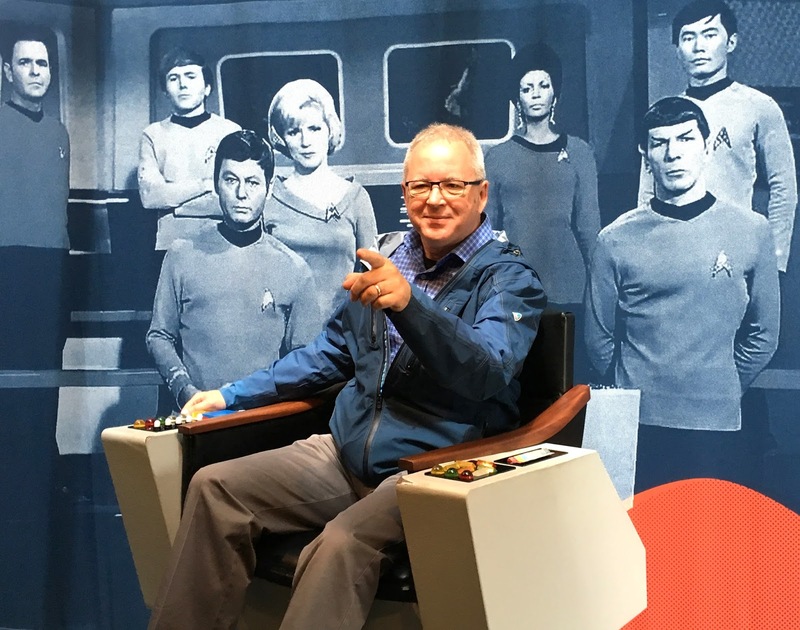 And actual phasers and tricorders and communicators and hyposprays! 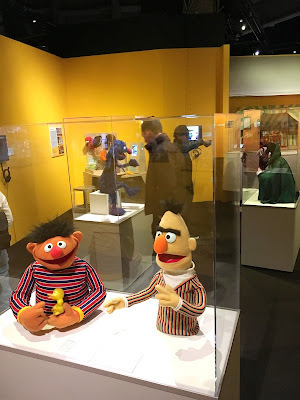 The MoPOP also has these guys . . .
. . . and those guys . 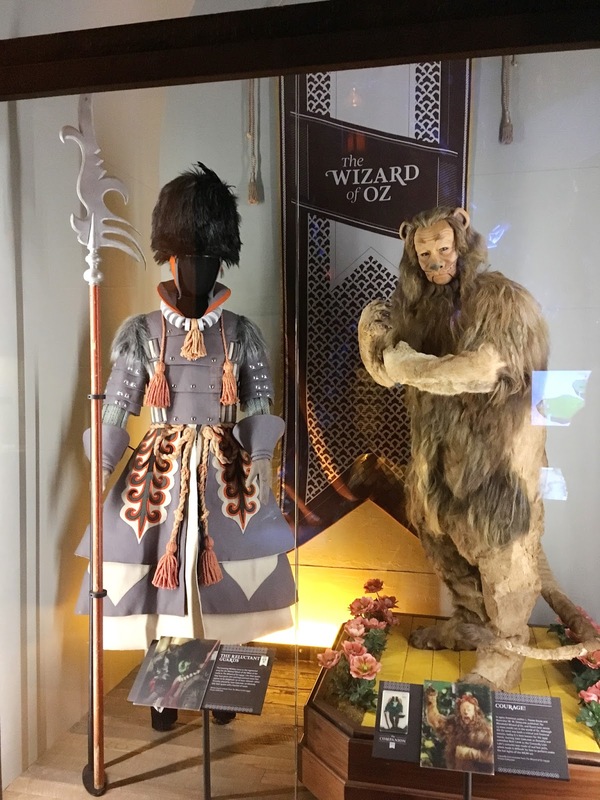 . .
Plus a special exhibition on these guys . .
. . . and all the other pop culture, rock-and-roll, and show business artifacts that Microsoft money could buy. 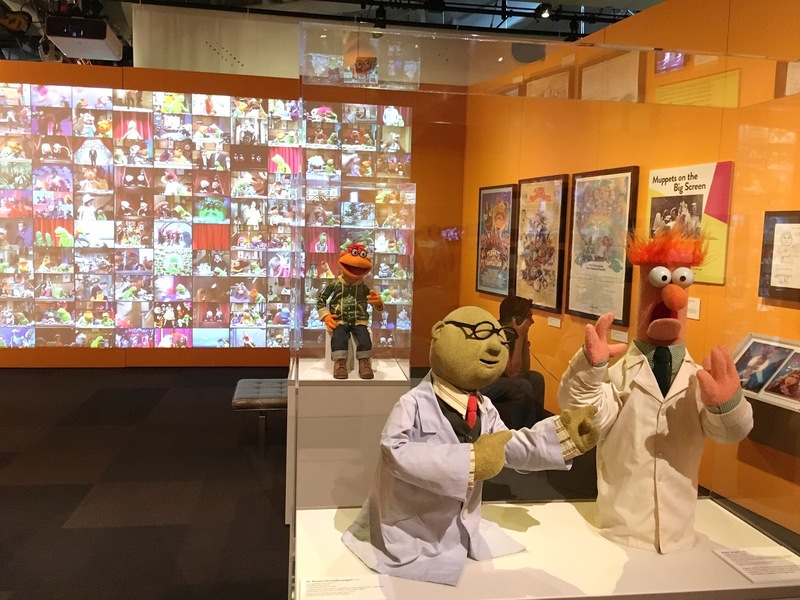 I really enjoyed MoPOP, all the more because I didn't know it was there and just stumbled onto it. What a discovery. My flight home was one of the best I've had in years. 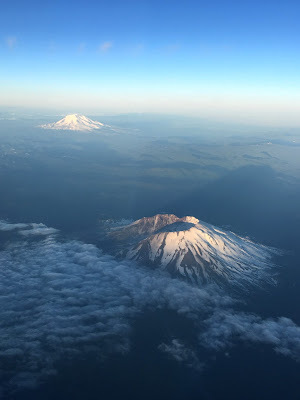 The plane was only about a quarter full and took off due south at sunset, giving us wonderful views of the snowcapped Cascades. I took a few photos out the window, knowing that they never capture one-tenth the beauty you see by eye. Mount St. Helens in the foreground, Mount Adams in the background. 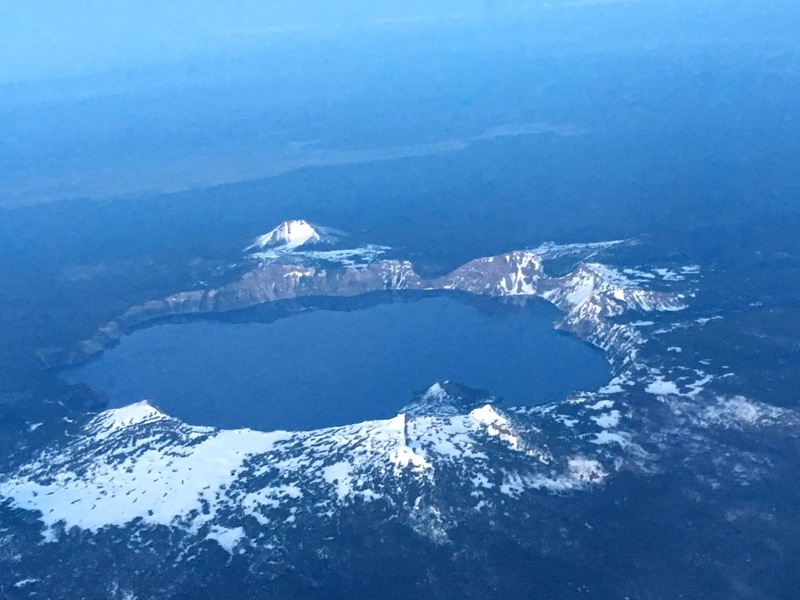 Notice the shadow of St. Helens stretching off to the upper right behind it. Neat! What a wonderful trip. As I told several people during the conference, I always go home from a big comics convention, such as the San Diego Comic-Con, feeling tired and beaten. I always go home from a GM conference feeling energized and inspired. Today at lunch, Karen asked me why that was. I really think people at a GM conference, besides just being generally smarter (face it, they're mostly RNs, MDs, MAs, and PhDs), are more deeply interested in the potential of comics as a medium--and stretching the boundaries of that medium---than your typical comics fan. Some of them are trying to make comics do things they've never done before. I went away with ten new approaches to think about and five new ideas I'm just going to outright steal. The best conference yet. 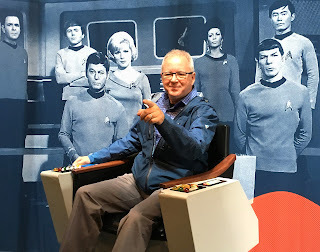 And not entirely because I found a "Star Trek" museum. Thank you so much, Brian! You've captured perfectly the inspiring spirit of the weekend, the conference, the conversations, the location, etc. Did you know that the 4th floor, understood to be the "heart of the library," was deliberately modeled after a heart? Pretty cool, albeit shudder-inducing. It was wonderful to see you and the rest of the GM family again. And I'm looking forward to future table paper collaborations with you--especially if it means catharting a lot! If the library's goal was to creep me out, they succeeded. Love the recap. Now of course I feel like I need to post my photos and insights. But really, you've done such a great job, what's left to say?